Our summer book selection here at Cook the Books is the first novel in author Laura Childs’ Teashop Mystery series, Death by Darjeeling. This delightful mystery series is set in Charleston, South Carolina and features tea shop owner Theodosia Browning, who left the high-pressure world of advertising to open the Indigo Tea Shop, where she and her knowledgeable staff serve and educate customers about how to properly brew and serve hundreds of varieties of teas. When Theodosia and her staff cater a historic homes garden party, one of the guests is found murdered, by a poison in his tea cup! It is up to our intrepid heroine to sleuth out the real murderer to protect her business reputation and avoid having her and her tea shop employees considered as criminal suspects. Our featured author, Laura Childs, has graciously agreed to serve as our judge for this round, which ends July 30, 2012. In addition, she has also offered to send a copy of her latest installment in the Tea Shop Mystery series, Agony in the Leaves, the thirteenth novel so far, to our Cook the Books winner, who will also receive the coveted Cook the Books winner’s badge for their blog. Since 2008, when Cook the Books was first started by me, Deb of Kahakai Kitchen and Johanna of Food Junkie, Not Junk Food, we have read and cooked from 21 great books, ranging from chef memoirs to literary fiction to collections of food essays. Somehow, though, we have not dug into a culinary mystery, so I thought it would be fun to dive into this Tea Shop Mystery series. This book also gives us the opportunity to try out some new teas, tea-flavored goodies and tea-time treats, so break out your lace tablecloths, dust off your best china and let’s have a tea party with Theodosia and Company this summer! 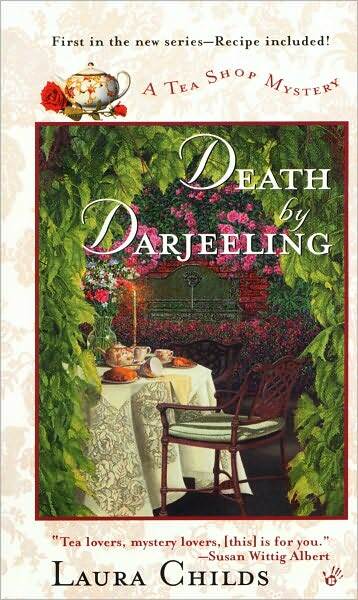 To join in the fun, all you need to do is buy or borrow a copy of Death by Darjeeling, cook something in your kitchen inspired by the book and then blog about it. You can leave a comment below to let me know that you have written your post or email me at infoat oldSaraTogabooks dotcom. I have already received two mouthwatering (and fun to read!) submissions, so I am looking forward to receiving others in the coming weeks for a lovely tea-infused roundup. We especially welcome new people to join our band of regular Cook the Book readers. First, let me say how honored I am that the Cook the Books Club chose “The United States of Arugula” both as reading material and as cooking inspiration. I am one of those writers who has never become jaded about the fact that he gets to write for a living, and when I see people moved to action–in this case, furious food preparation–by something I have written, it compounds the joy I take in my work. So: Runner-up is Deb, whose crostini with strawberries, baby arugula, and goat cheese are both beautiful to look at and imaginative in their harmonious but slightly off-center combination of flavors. (Sweet + peppery + creamy.) I also liked the fact that, because of the time of year it is, I was able, like Deb, to make these crostini with local ingredients from the farmer’s market, even though we live six time zones apart. And the winner is: Eliot, for the smoked log of goat cheese. Probably the least aesthetically pleasing of the entries, looking, in its final state, like something removed from a patient rushed into emergency surgery after collapsing in abdominal pain. 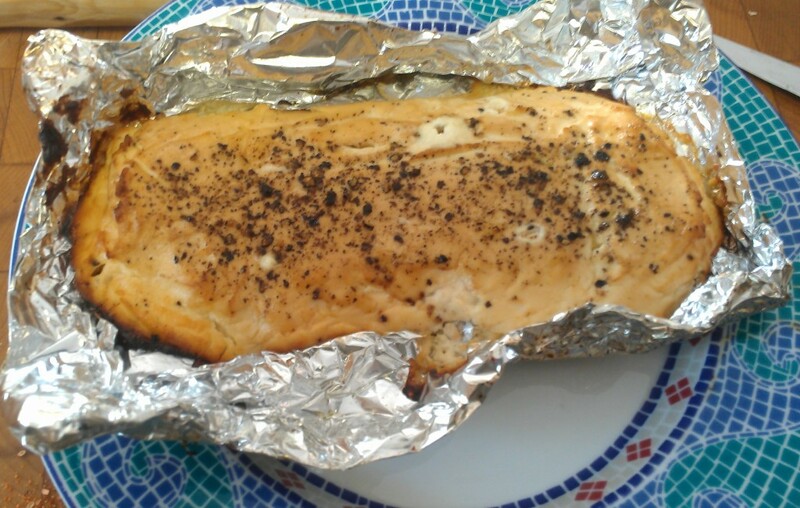 But this was the recipe that I read and thought “Good god, this is something I must try as soon as I am able!” Eliot’s recipe requires patience but otherwise couldn’t be more simple–and, better still, it invites all manner of variation. Best of all, it manages the noble feat of making fresh goat cheese, already one of my favorite foods, taste even better. I see from the “About Us” tab of the Eliot’s Eats blog that Eliot is actually a pseudonym for a self-described “near middle-aged couple.” On the basis of their smoky, delightfully nuanced goat cheese, I think it is high time that this couple proudly go public with their identities. I hope you are having a great weekend. Below you will find a delicious roundup on “United States of Arugula”, by David Kamp. Enjoy! 1. 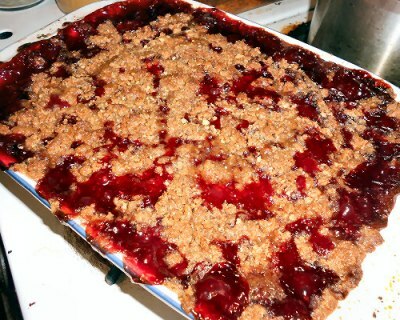 Glennis of Can’t believe We Ate made a strawberry and rhubarb cobbler with mint. Glennis was a young wife in the ’70s and remembers many of the people mentioned in the book. She admits that she somehow missed out on Julia Child, but was a n avid fan of Graham Kerr. Her dish was based on a recipe by Alice Waters and is based on ingredients which are at their peak: strawberries, rhubarb and a touch of basil, instead of mint. Sounds delicious! 2. Andreas of Delta Kitchen, our only male contestant, made a lentil and sweet potato soup . Andreas was inspired by current food trend, where chefs are going back to home-y, uncomplicated food. 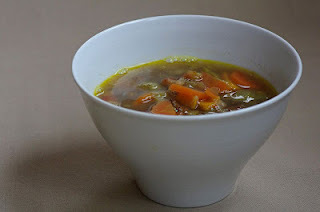 His soup is rustic, filling and perfect for those chilly nights still with us before we go into full summer mode. 3. 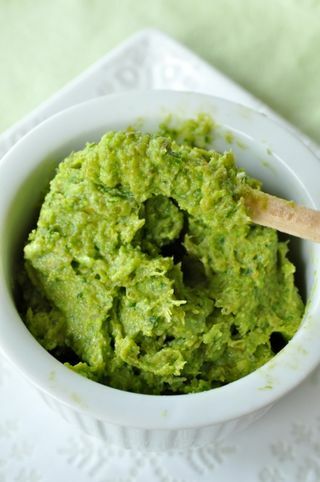 Simona of Briciole made a fava bean and scape spread. Simona is of Italian roots, but has been living in the San Francisco Bay area for the last 18 years. She doesn’t understand what the fuss is about French food, as she is very content with her Italian heritage. Her dish is inspired by a passage from the book that refers to Alice Waters and combines elements of Italian food (fava beans with pecorino) and new ingredients she has learned to appreciate in the States (garlic scape). It is fresh, seasonal and healthy too and perfect for a spring menu. 4. Eliot of Eliot’s Eats, made a lip-smackingly good smoked goat’s cheese. Eliot really enjoyed the book and cannot picture herself living without goat’s cheese and sun dried tomatoes. The recipe she shares with us comes from a fellow blogger and apparently is also good tossed with pasta. 5. Claudia of Honey from Rock made Creamy Green penne with three cheeses. 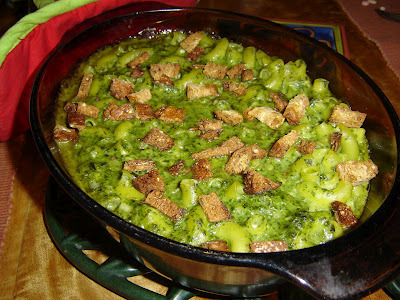 Claudia also thoroughly enjoyed the book and was inspired to make the dish which is a twist on the classic “mac n’ cheese”, trying to prove that green can also be good for you. I couldn’t agree more! 6. 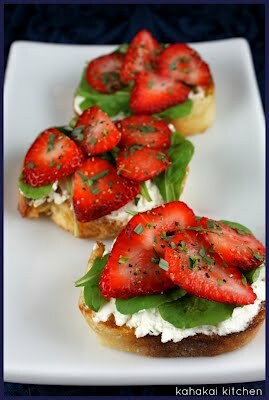 Deb of Kahakai Kitchen made Strawberry, baby arugula and goat’s cheese crostini. Deb, like Claudia, owned the book for a while, but hadn’t read it and she was glad she did for our little club. She was inspired by the title of the book, but also by Alice Waters and the whole Califoarnian food movement, to make these flavoursome crostini. Yum! 7. 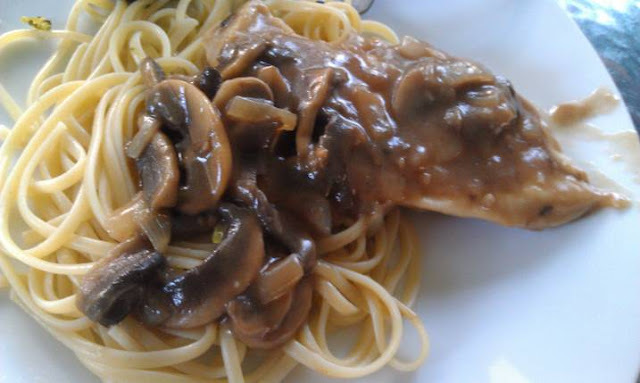 Tina of Life in the slow lane at Squirrel Head Manor made Chicken Marsala. The recipe is by Julia Child and admits that she “loves the aroma of Marsala as it hits the hot pan”. 8. Rachel of the Crispy Cook made cooked radish greens. She loved Kamp’s book and admits, like others before her, that it has earned a “permanent place in her home library”. 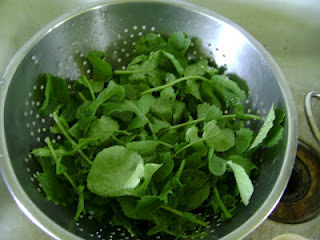 Rachel was inspired by the title of the book and was aiming for a cooked version, but she ended up cooking radish greens, which she mistook for arugula! They apparently tasted good too, so no harm done. 9. Finally I, Johanna of Foodjunkie, decided to make a healtier, less sugar-laden version of an American classic, the cupcake. 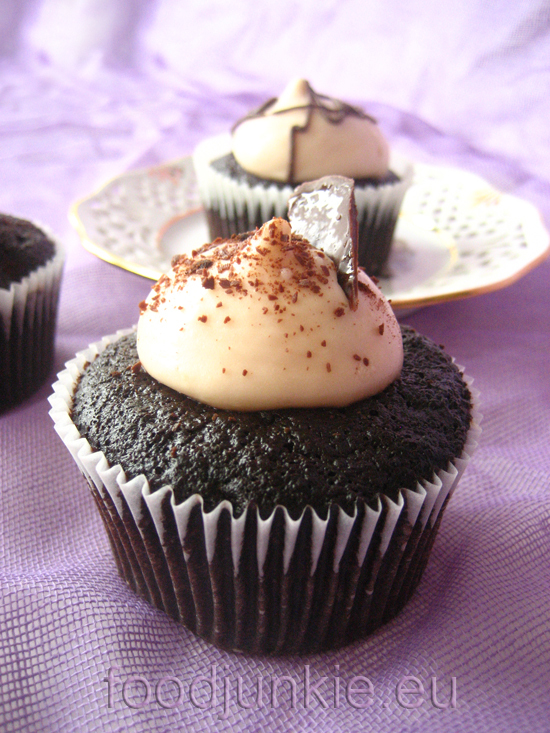 I made black velvet cupcakes with cream cheese frosting and you should definitely try them!